Welcome back to the second annual Greatest Battle Report Awards! After the success of the first Greatest Battle Report Award in 2017, I've decided to organise another one for this year. The format is much the same, but have introduced a few innovations in the process that I hope will encourage more entries and more visibility for the Nominations. 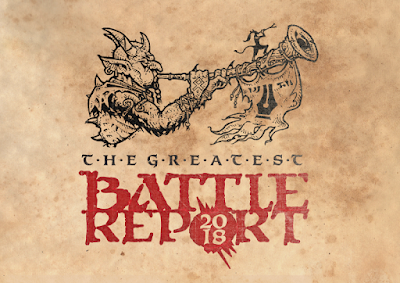 Nominate a Battle Report - for any tabletop, miniatures gaming system, as the Greatest Battle Report of 2018. We're looking for anything and everything great in the world of Wargaming and Tabletop Miniatures, perhaps it has a great narrative, perhaps the table layout and photography was stunning, perhaps the models were just really cool, perhaps the improvisation and counts-as thinking reached genius level, or maybe everyone playing had a really great time and the love for The Hobby™ shines through. Whatever you think makes for a Great Battle Report - that's what we want to see nominated. If you want some idea of the amazing efforts gamers go to in creating their Battle Reports, feel free to view last years nominations, and last years glorious winner Pitch Invasion by Nico. 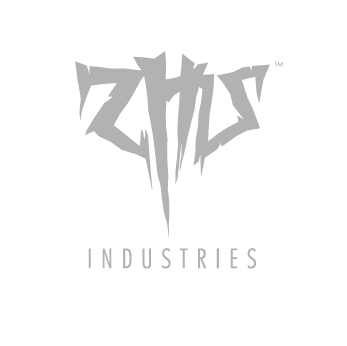 Email Zhu with the subject line "BatRep18 Nomination"
The Battle Report must be publicly accessible. Nominations for Battle Reports behind paywalls, on register-to-view sites or published in magazines or commercial wargaming companies websites will be discarded. The Battle Report must have been published in 2018. All nominated entries will be listed in a blogpost on this website. Self-nominations are allowed, and in fact encouraged! If you nominate a third party Battle Report, and not your own, please notify the author in some way (comment on the blogpost) that they have been nominated for The Greatest Battle Report of 2018. Feel free to link to this post by way of explanation, but it is by no means a requirement. In 2017 we had 10 Nominations, which was a great response and an easy number to deal with. Should we have more than 12 Battle Reports Nominated in 2018, these will be shortlisted to a maximum of 12, on a first-come, first served basis. The closing date for Nominations will be 30th November 2018, so get your nominations in quick! Voting will probably be by SurveyMonkey, starting around 1st of December, running to 31st December 2018. The aim of the Greatest Battle Report is to spread the word, and get more people to read the many great Battle Reports that are out there, so once Voting is under way, it is critical to get as many people to vote as possible, motivate your base and mobilise your clamouring cult of followers to vote for you. The Greatest Battle Report remains a stubbornly fannish affair, curated and voted for by the community. Everybody wins because everybody gets to read great Battle Reports they might have otherwise overlooked. The reward for coming first place and being crowned The Greatest Battle Report 2018 is to bask in the admiration of your peers, and know that your creative endeavours have been recognised as a example of hobby gaming. You can also display "The Greatest Battle Report 2018" banner alongside your blog to honour the recognition your Battle Report has received - although of course this is entirely optional. Let the well documented, entertainingly written and presented battle commence! Self nomination here. A really fun battle and I think I did it justice. Utter carnage! Closely fought battle there, and great to see the deciding objective taken by Chaos almost by accident! Great report. Good, Can I humbly suggest the report I wrote (amongst others) about a Chaos Vs Law 3 game campaign we fought with Nico and a friend in May ? Wow, there's a lot going on on that page. Last years champion team returns and throws down a serious gauntlet! Nice switch from skirmish to mass battle. Muchly ta in advance, great idea to run this again so a huge thanks for taking it on. Another fantastic contender. I love hexagons and your minimal colourscheme. Strong flowing narrative and home-rules. Excellent! Excellent! Nice to see a bit of Gorkamorka. Unfortunately The Award can only be for one batrep. I've taken the liberty of picking out http://dasnerdspiel.blogspot.com/2018/09/mini-campaign-tellyportas.html as Turnipmaster notes it was the most fun - but if you have an alternative favorite, do let me know! Woo-hoo! Another heavyweight contender enters the ring - epic battle, an epic table all presented as an epic comic strip. Great to have you onboard again..
Also, good work to all entries ahead of mine. It's amazing to see what everyone is doing! Hey, Thanks T-Town! Great looking table and an interesting skirmish. Yeah it's all about seeing what everyone else is up to and everyone else seeing what you've done. Nice stuff! I was about to delete your comment on my blog as I thought it was spam. But I thought about your name and felt I had seen it before. 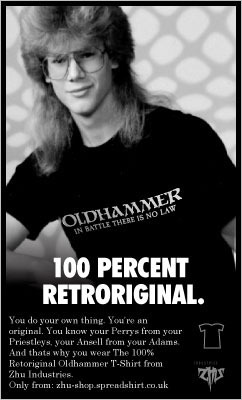 And yes indeed, I had read your Oldhammer manifesto post some time ago and it resonated with me. I dont know who nominated my blog AAR but thanks whoever you are. Hi Mar Rosquites! Your excellent battle report was nominated by Twisted Moon over on the Oldhammer Forum. As a long time lurker on your blog, I was very happy to see it nominated for the award. 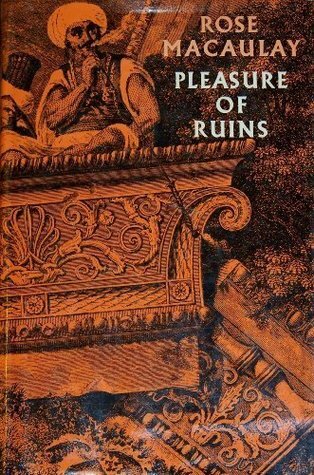 A wonderful eclectic mix of miniatures, great scenery and narrative. Death Cave Doom - I've been drawing some people dying in horrible ways. This is for Lamentations of the Flame Princess, of course.